If you’re the type of person who books bi-weekly facial or body waxing appointments, it might be time to start thinking about laser hair removal and eliminate your hair waxing regiment forever! The spa team at Treuvís Eyes Nails Body Laser Spa in Clinton Township, Michigan, can help you achieve smoother, hairless skin with the most advanced and newest technology of “Cool” laser hair removal devices. European Italian technology, arriving from Italy, Treuvís is proud to have the first “Cool Laser” device in Michigan: the “Horizon.” To learn more about laser hair removal, book a free no-obligation consultation by calling the spa directly. What is the Horizon laser? The Horizon laser is the most advanced aesthetic tool available and uses European technology straight from Italy that you can’t find at any other laser hair removal spa. Treuvís is proud to be the first spa in the Michigan area to carry this amazing device. The Horizon provides maximum comfort with its groundbreaking “SubZero Cooling” European Technology, The Horizon laser treatments has the ability to adjust settings to fit your aesthetic needs and skin tone, so you get the most effective treatment. Equipped with cool skin technology to minimize discomfort. giving exceptional results virtually pain-free! What happens during Horizon laser hair removal? Laser hair removal with the Horizon cool laser involves using laser energy to disrupt your hair’s natural growth cycle. During treatments, your Med Spa technician glides the handheld laser device over your treatment area. With each pulse of light, laser energy heats up your hair shaft and follicle, without burning or overheating your skin. Once the laser energy eliminates the hair follicle, hair sheds out naturally on its own through your own hair growth cycle over 4 to 6 weeks. Each time your hair grows back — if and when it does — after your laser hair removal session, it’s finer, thinner, and much lighter than it was in the first place. Your laser hair removal treatment package at Treuvís Eyes Nails Body Laser Spa is tailored entirely to your desired needs. Yes. Once treated hair is gone, it’s generally gone for good. Occasionally, new hair grows in, even though you’ve already been treated in the area. Usually, this occurs due to hormonal fluctuations, especially in women. If you ever experience new hair growth in the treatment area in the future, you can always come back to Treuvís Eyes Nails Body Laser Spa for quick touch-up sessions. Generally, 80-90% of good candidates will need at least 4-6 laser sessions spaced 6-10 weeks apart to experience 80-90% hair reduction. The cycle of hair growth has three phases and laser is killed in the active growing phase. 4 to 6 treatments are needed to target ALL hair in the active growth phase. 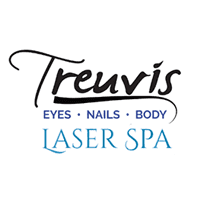 Schedule your laser hair removal consultation at Treuvís Eyes Nails Body Laser Spa today. Call to schedule a free no-obligation consultation today.